Republic First Bancorp, Inc. (NASDAQ:FRBK) , the holding company for Republic Bank, has announced the location of its fourth Southern New Jersey retail store at 100 William Dalton Drive in Glassboro. Reflecting a design similar to its recently opened Cherry Hill and Voorhees locations, the Glassboro store will feature Republic Bank’s unique all-glass cube, which aims to welcome Customers and present an inviting atmosphere in which to fulfill their banking needs. Construction at the location began this summer and a Grand Opening is scheduled for December 2014. 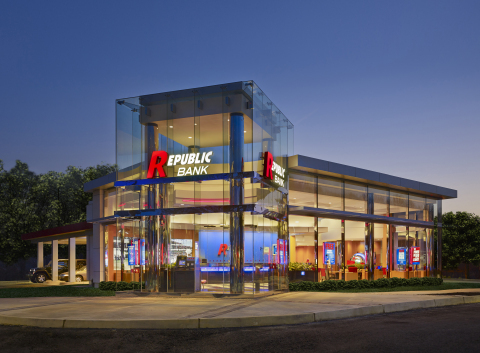 The site selection marks the next step in the bank’s growth plan, coined “The Power of Red is Back.” During the last 12 months, Republic Bank has opened a new store in Cherry Hill, relocated stores in Voorhees, NJ and Media, PA, and renovated its flagship store in Center City Philadelphia. Over the next few years, the bank plans to build additional stores in Southern New Jersey, specifically in Marlton, Berlin, Moorestown, Mount Holly, Medford and Washington Township. Republic Bank also plans to add a second store in Cherry Hill. As one of the largest Philadelphia-based retail banking institutions, Republic Bank has 14 locations including stores in Abington, Ardmore, Bala Cynwyd, Plymouth Meeting, Media and Philadelphia, Pennsylvania and Cherry Hill, Haddonfield and Voorhees, New Jersey. The bank plans to continue to bring its Customer-centric benefits – including extended hours, absolutely free checking and 55,000 surcharge-free ATMs – to its new Glassboro customer base. For more information about Republic Bank visit www.myrepublicbank.com. Republic Bank is the operating name for Republic First Bank. Republic First Bank is a full-service, state-chartered commercial bank, whose deposits are insured up to the applicable limits by the Federal Deposit Insurance Corporation (FDIC). The Bank provides diversified financial products through its fourteen offices located in Abington, Ardmore, Bala Cynwyd, Plymouth Meeting, Media and Philadelphia, Pennsylvania and Cherry Hill, Voorhees and Haddonfield, New Jersey. Republic First Bancorp, Inc. (“the Company”) may from time to time make written or oral “forward-looking statements”, including statements contained in this release and in the Company’s filings with the Securities and Exchange Commission. These forward-looking statements include statements with respect to the Company’s beliefs, plans, objectives, goals, expectations, anticipations, estimates, and intentions that are subject to significant risks and uncertainties and are subject to change based on various factors, many of which are beyond the Company’s control. These factors include competition, timing, credit risks of lending activities, changes in general economic conditions, price pressures on loan and deposit products, and other factors detailed from time to time in the Company’s filings with the Securities and Exchange Commission. The words “may”, “could”, “should”, “would”, “believe”, “anticipate”, “estimate”, “expect”, “intend”, “plan”, and similar expressions are intended to identify forward-looking statements. All such statements are made in good faith by the Company pursuant to the “safe harbor” provisions of the Private Securities Litigation Reform Act of 1995. The Company does not undertake to update any forward-looking statement, whether written or oral, that may be made from time to time by or on behalf of the Company, except as may be required by applicable law or regulations.